For the more than 40 million Americans in poverty, everyday life is a struggle — buying food, going to school, getting a job. And for a great many of them, what most people think of as simple tasks are also difficult. 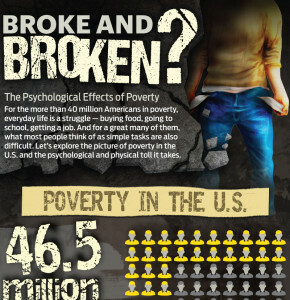 Let’s explore the picture of poverty in the U.S. and the psychological and physical toll it takes. Researchers have determined that the mental strain placed on a poor person is immense, affecting their ability to do well in school, to succeed at work — even to pay bills on time. Why? While there’s much about the human mind scientists have yet to decode, we do know that mental processing is finite. It’s the reason you think less quickly at the end of a long day. Adding to the reduced mental capacity brought on by poverty, the poor also have to navigate the rigors of everyday stress, most of which are made far worse by lack of income.